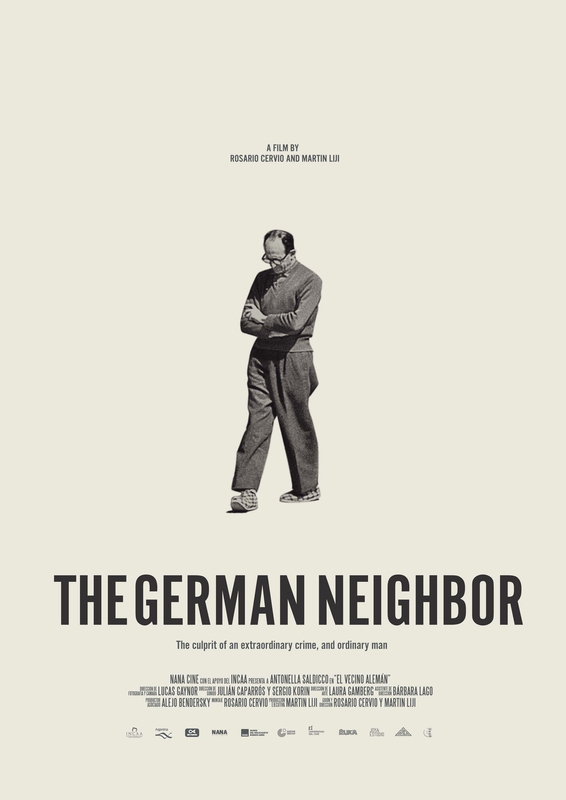 Integrating impressive archive material, The German Neighbor follows the steps of Adolf Eichmann’s awkward and unusual life in Argentina and his remarkable defense at the trial in Jerusalem. Roberto Klement was a gentle and respectful neighbor in Buenos Aires. But Klement was actually Adolf Eichmann, the executioner of “the Final Solution to the Jewish Question” in WWII. In 1960, Adolf Eichmann was kidnapped illegally and taken to Jerusalem for the Nuremberg trial. Fifty years later, Renate Liebeskind, a young German translator living in Argentina, is hired to translate that trial into Spanish. Eichmann’s vulnerable image and matter of fact testimony puzzle Renate. Entangled by certainty and ambiguity, she starts looking for answers in conversations with historians, reporters, philosophers, and family members. 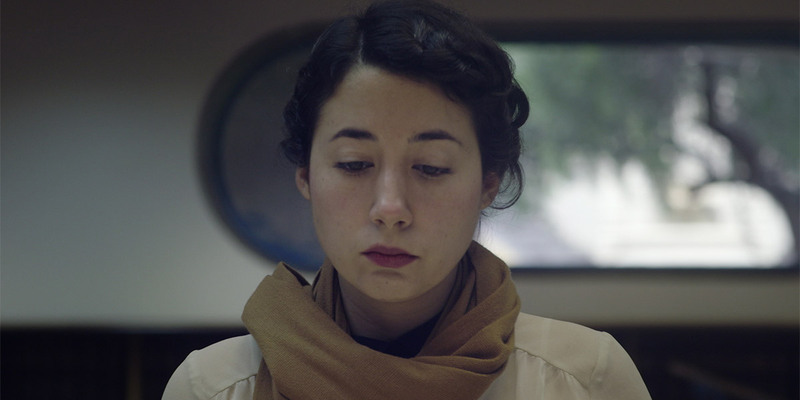 Not completely satisfied, she embarks on a journey that follows the one traveled by Eichmann after his arrival in Argentina. The film combines the exploration of Eichmann’s daily life during his exile in Argentina with images of the trial in which he was sentenced to death by hanging in 1961. “Long live Germany! Long live Austria! Long live Argentina! These are the countries with which I have been most connected and which I will not forget. I had to obey the rules of war and my flag. I am ready.” – Last words of Adolf Eichmann, Thursday evening on May 31, 1962, at the gallows of Ramla prison. Rosario Cervio was born in 1985 in Adrogué, Buenos Aires. She studied history and philosophy at the Universidad Catolica Argentina and Film Direction at Universidad del Cine. She directed Guernica and Las segundas, both premiered at the BAFICI (2010 and 2012 respectively). Las segundas won the Jury Prize for Best Short Film at Camboriu Festival (Brazil, 2013). Martin Liji was born in 1984 in Buenos Aires. He produced the Guernica (2010) and Las segundas (2012) short film, directed by Rosario Cervio. He is the director and screenwriter of the short film Bohemia (2015). 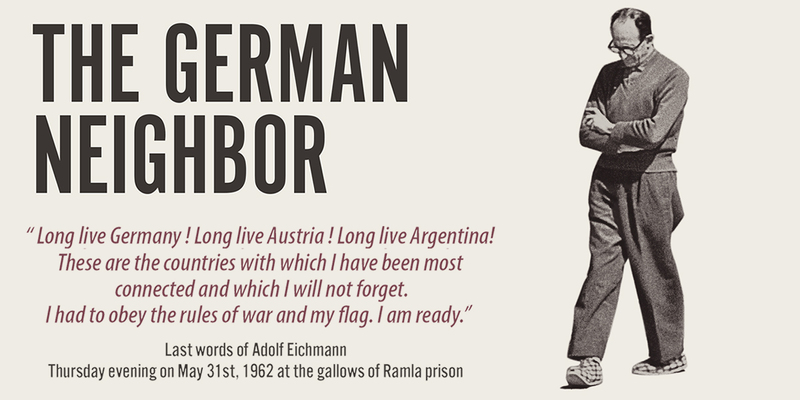 With just these few words the ObersturmbannfUhrer became part of Argentina’s national history. Since then, his stay in our country stops being casual or strategic and regains new meaning: Eichmann lived among us and lived like one of us. The stories from World War II are not chronicles of distant times and places anymore once we learned that the person responsible for the execution of the Final Solution had lived just 15 minutes away from our place. Becoming aware of this fact and feeling (unwillingly) so close to one of the greatest modern criminals was the starting point of The German Neighbor. Besides our interest in exploring our history in more detail, there was a desire to look at the impact of Eichmann’s trial in Jerusalem. And the fact is that if he had not been kidnapped, taken to Israel illegally, tried and sentenced, many things would have been different in both Argentina and the rest of the world. For instance: the dictator Rafael Videla wouldn’t have been tried for his role in Argentina’s dirty war. Ultimately, The trial in Jerusalem engraved this idea in the conscience of the world: there are crimes that should not be forgotten because they violate basic human rights.